My first real memory of my grandparent’s home in Saint Louis Missouri, was traipsing down the basement stairs, slipping and sliding in my new patent leather shoes, at age 4. I was looking for, “Tommy the turtle” being the youngest grandchild we had at that time I had learned that he would allow me to tickle his neck. 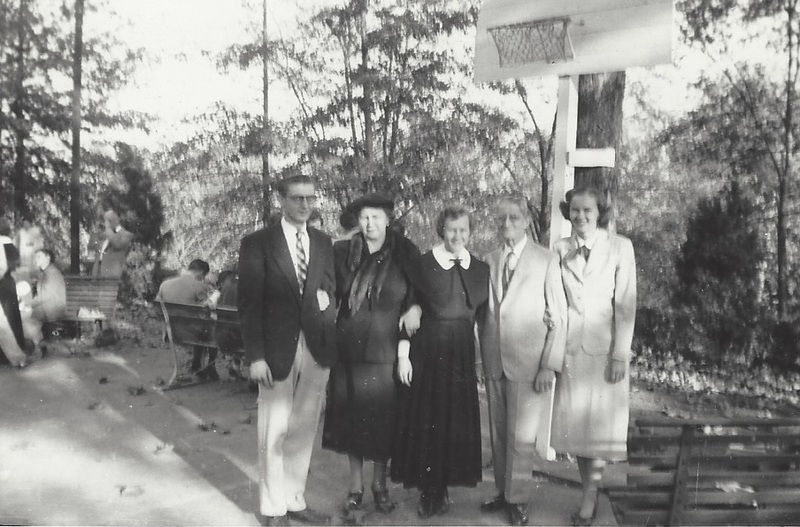 This is the Frank Feuerbacher’s family. 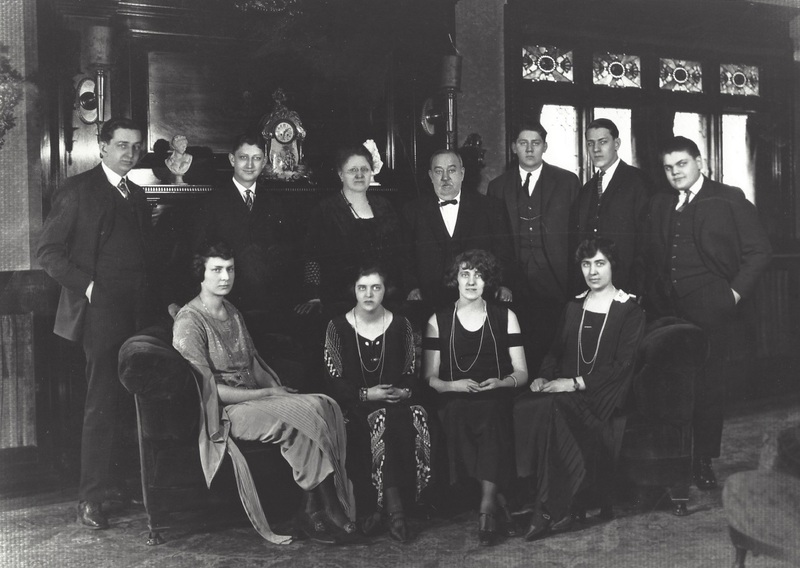 The backrow center is Frank and his wife, Caroline Feuerbacher. And in the front row, is my mother Caroline with all that curly( red) hair. Originally there were 12 children, 4 sons had died already from childhood diseases that today are curable. The background of this photo is the fireplace—much loved by my two brothers and me for the many Christmases we drove from Toledo to St. Louis to celebrate. On Christmas Day, after the destruction of the gift wrap , the living room was a shamble of torn paper—and we adjoined to the dining room. 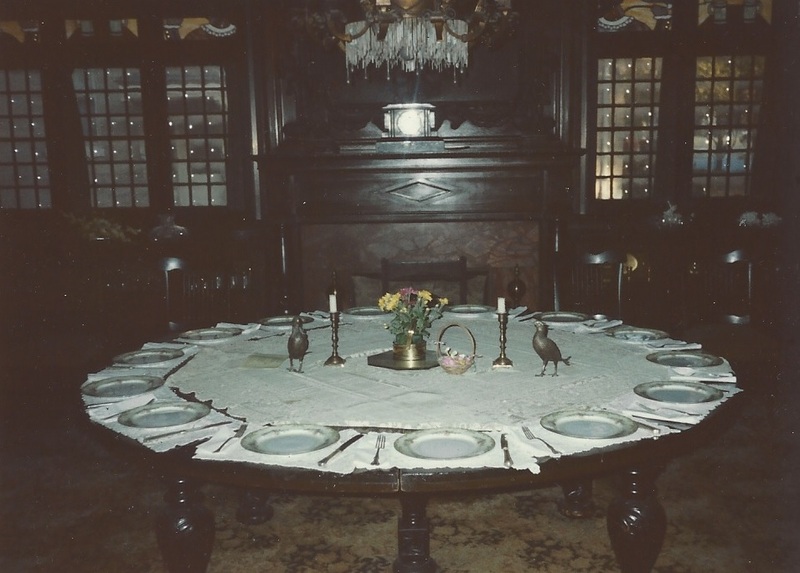 The dining room was used daily with seating of up to 25 people. Frequently we played hide-and-seek in the darkened and unused room…. any older family member who walked by hearing the noises, would just keep on walking and ignore it. Since only four of grandfathers children married, producing three children in one family, two in another, and four in the Murray family. There were no more male decedents left as of two years ago. 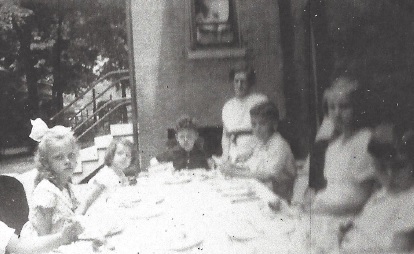 The following picture is of Elizabeth Feuerbachers Ganss with her husband George and their three children: George Junior never married, his sister Betty in the picture is a Nun who survived the Church’s changes for the Nunneries, and daughter Carolyn who has five children. Uncle Fred Feuerbacher had two children: Father Edward who became a Marvelous Parish Priest, and a daughter whom all are dead now. 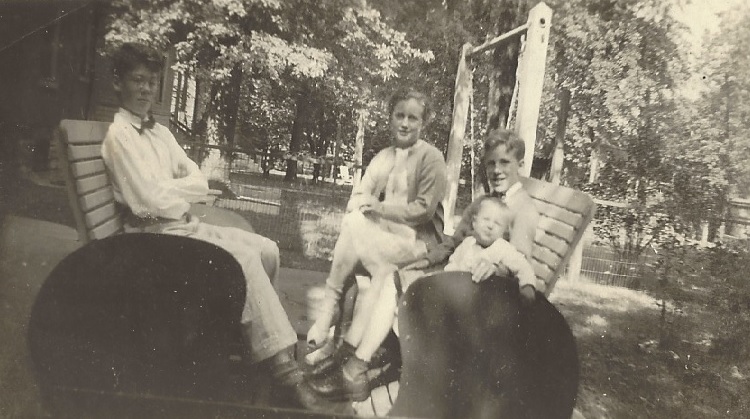 And the end of the Frank Feuerbacher name and male legacy— but the female descendants carried on the family traditions. Ohio to St. Luis is not a short drive but over the following years the Murray’s would make the trip or vice versa. Our maturation was quite different from out St. Luis cousins-vice verse- but we continued to meet and loved it. The following three pictures might explain the differences. The Feuerbachers had a “river house” and in this first picture you can even see a little bit of the river on the left. Immediately after the photograph both my brothers and I ran into the house to get our swim suits. And we went screaming down for the rope that out dad had helped us tie on a tree above the water. And one at a time leaped onto the rope and off into the river! 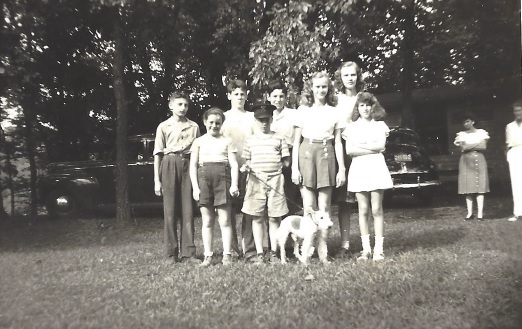 All the other kids were forbidden- except Georgie (on my right side) he came running after- in his underwear! 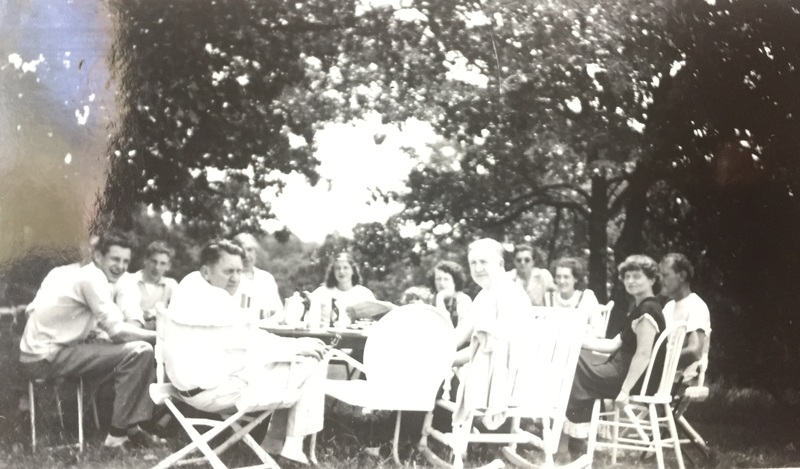 Picture number 2 is a typical picnic planned by the Feuerbachers. All adults sitting in chairs with plates and silverware- and no children. This was a picture of the grandchildren at grandpa’s house in St. Louis. All nicely dressed and controlled by two overseers- eating off of china plates. And using silverware and nary a smile in place. All Murray children could swim by the time they could walk and also climb ropes and much much more. 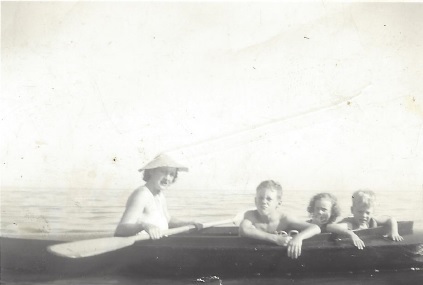 On our summer trips to grandpa Murray’s home our aunt Mary and avid swimmer would take the three of us Murray kids: Tom, Franky, and me out for canoe rides. The only condition was when we were close to the shore we would swim in- and dash loved it. The only repayment was to help pull the canoe ashore. 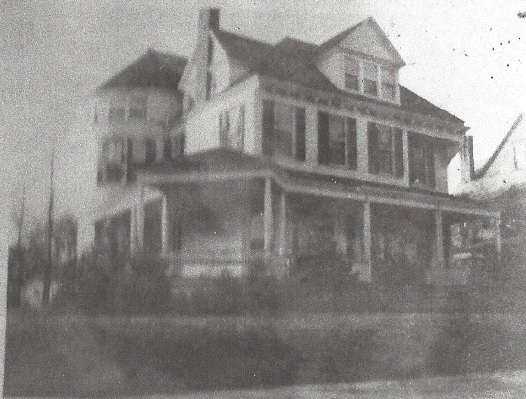 Now to include grandpa Murray’s family home in Bridgeport, Connecticut. A very large house with four floors, including the reference/reading room at the very top- with an ocean view. It was set in a large yard, frontal view of the Long Island Sound and two huge cannons facing the water. They were wonderful to climb up and down, and get pushed off of too. Originally they were built for defense against attacks along the Long Island Sound- but the attacks never came. 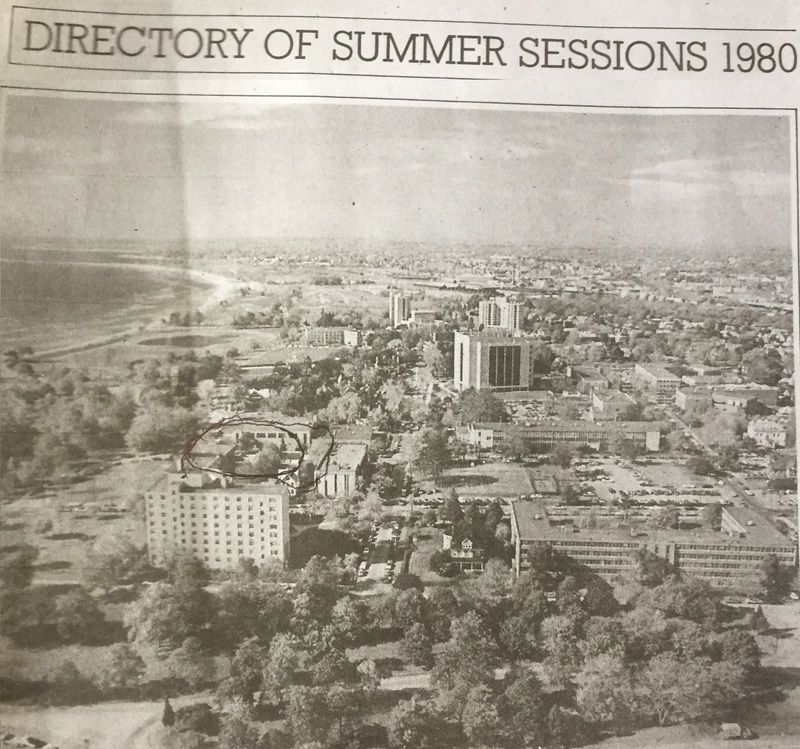 The circled part of the picture is the original house being smothered by the new campus buildings. So what did grandpa Murray do? He willed it to them after he died at the highest possible price. Two Families, intertwined, who saw the world differently, and as they aged discovered the differences.